Grinta is a fertlizer program in a bag. 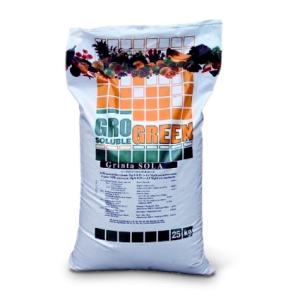 Grogreen Grinta is a water-soluble fertilizer line for soil grown horticultural crops. This range of products have a double objective: guaranteeing the availability of all nutrients in the correct proportions and providing considerable convenience in usage. Each formula is fine-tuned to the nutrient needs of its specific target crop. Grinta is not just a fertilizer, it is a fertilizer program on its own. 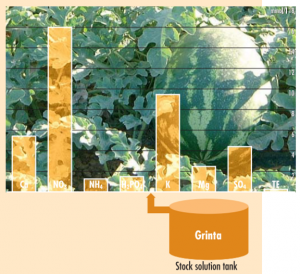 Grogreen Grinta formulations are adjusted to the needs of a certain type of crop. All macronutrients and micronutrients are carefully balanced to match the nutritional needs during the entire growth cycle. Intensive horticulture requires high quality and balanced soluble fertilizers. Grinta is potassium nitrate based with the optimal required sulfate content avoiding the risk of salinisation. All trace elements are chelated with the proper chelating agent to guarantee optimum availability at high pH-values. Preparing the stock solution is easy and chances of making mistakes are reduced considerably. Our products can be applied using various fertilizer units. Grinta is crop specific and can be used during the entire growth cycle.